The Integrity Commission does not intend to pursue declaration of assets and liabilities from public officials which should have been made before 2018. Commission Chairman, Kumar Doraisami has said that they hardly received any declarations in the past two years, because the Commission was deemed to be non-existent. “There was a problem before when the Commission was not functioning, because we didn’t have a Chairman and the other Commissioners in place. The question that arose at that time was: if you have to file with the Commission and there is no Commission, then where do you send the declaration form,” Doraisami stated. 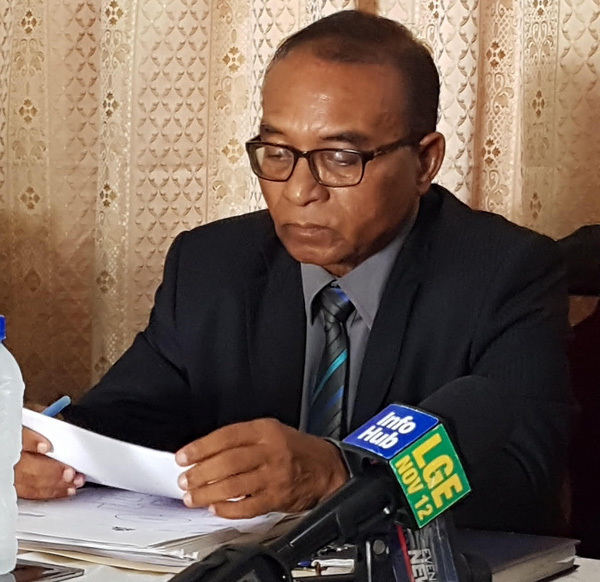 Opposition Leader Bharrat Jagdeo last week called for the Commission to not only pursue the 2018 declarations, but for the three years during which the Integrity Commission Secretariat was disbanded by the Coalition Government. Doraisami shares the view that the Integrity Commission Act did not say that a declarant could file with the Secretariat. He said some of the MPs did not want to send their declarations, because there was no Commission. Up until this year when new Commissioners were installed, the Commission received voluntary submissions which averaged between five and 20. Last year, the Commission received five submissions. Official information from the Commission is that 1296 letters were sent to public officers who are mandated to file their declarations with the Commission on or before June 30, each year. The Commission had reported to have received 248 responses and only some MPs had responded. The response rate at the time was 19%. Up to last Thursday, Jagdeo was among the large group of public officers, including Members of Parliament, who had not declared their assets to the Commission for this year. Jagdeo was questioned by Kaieteur News about whether he and other MPs of the People’s Progressive Party (PPP) had made their declarations which was past due. Jagdeo admitted that he had not filed with the Commission. “We will get it done, because it is something that we believe in. When we were in office, we made sure that every Minister did up to 2014,” Jagdeo had stated. Jagdeo fixated his response on whether the Government members had declared their assets. “You just ask the other side if they have done. They have not done so for three years, so I hope that the Integrity Commission goes back to the starting point,” Jagdeo stated. Under the law, any public officer who fails to comply with the Commission is liable upon summary conviction, to a fine of $25,000 and to imprisonment for a period of not less than six months or more than one year. Public officers including the President, Permanent Secretaries, Director of Public Prosecutions, Auditor General, Commissioner of Police, the Army Chief, Heads of the Service Commissions, Foreign Affairs officials, Judges and Magistrates and Department Heads are required to declare their assets. Also required to submit declaration forms of their earnings and gifts received are Regional Executive Officers, the Chief Elections Officer, Mayors, Chairpersons and Chief Executive Officers of state companies, Registrars of Lands and the Commissioner-General of Guyana Revenue Authority, along with Presidential Advisors, and Heads of the Guyana Geology and Mines Commission and Guyana Forestry Commission. Public officers are also required to operate within the Integrity Commission (Amendment of the Code of Conduct) Order 2017, which addresses, frontally, matters relating to discrimination, bribes, conflict of interest, handling of classified information, use of public property and sexual misconduct, among others.